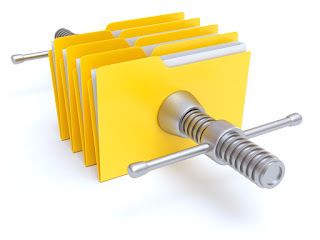 Every day, we are being introduced with new and innovative technologies involving online file management and Knowledge Management. IT guys, are trying to implement this technologies to their daily work to improve or accelerate their productivity and efficiency without compromising security. While this may not be a big deal for a business with 5-10 people, it may introduce problems when the small "family" firm starts growing. Cryptography, from Greek κρυπτός, ("hidden secret") and γράφειν, ("writing" ) is the practice and study of techniques for secure communication in the presence of third parties. Usually this involves communicating through sophisticated protocols and softwares that compile with some general rules of this extremely broad science. While you may not be interested to learn more about Cryptography, you should at least know the basic terminology and the types of cryptography so that you can be comfortable when reading articles on this matter. Encryption : Encryption is to convert the data in some unreadable form. Authentication: Authentication ensures that the message was originated from the originator claimed in the message. Integrity: Integrity ensures that the messages that are received by the receiver are not altered anywhere on the communication path. Non Repudiation: Non Repudiation provides proof of the origin of data and high assurance to be genuine through the use of digital signatures. Secret key Cryptography (symmetric encryption): The sender applies a key to encrypt a message while the receiver applies the same key to decrypt the message. Public key cryptography (asymmetric encryption): Each party has a private key and a public key. The private key is secret and is not revealed while the public key is shared with all participants in the communication. Hash Functions: This technique does not involve any key. Rather it uses a fixed length hash value that is computed on the basis of the plain text message and are used to check the integrity of the message to ensure that the message has not been altered, compromised. For more please read the detailed article on "The Geek Stuff" here : "Introduction to Cryptography Basic Principles"
I found you are website via Yahoo and I have to express. A Gigantic Many thanks very much, I considered your article was very interesting I’ll get back to see what more great information I will receive here.